Senior Tyson Steffenhagen, right, stands with the brass section during marching band practice at Ooltewah High School. How does a high school band director get the best possible performance from his or her musicians? The answer is not to create a strict environment, but rather to create a comfortable one, where students can feel like themselves. After all, the competitions these high school bands face are tense enough — when one student's out-of-place step or note can hurt the whole band. They are judged on the total package of their performance: the music's precision and creativity, the visuals of the accompanying color guard flag team, the technicality and perfection of the band's marching pattern and the "effect," or the emotional response elicited from the judges. And most high school marching bands can only attend a few big competitions each year. Every practice matters. The stakes are high, but the payoff can last a lifetime. "People don't remember trophies. They remember experiences and the people they make them with," says Ooltewah High School band director Joel Denton. "I promise that many students in my band room will be best friends for the rest of their lives because of what they've gotten to experience together." In order to get the best possible performance from their students, the teacher must turn the band into a family. 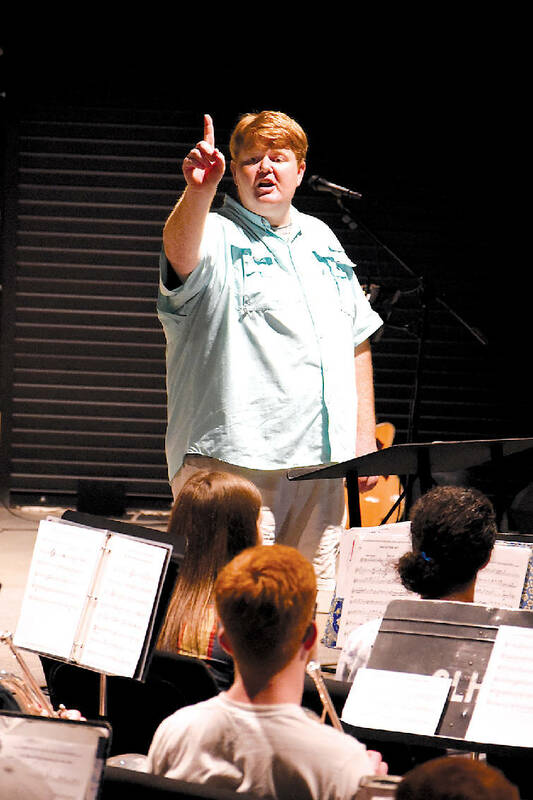 "My biggest success stories are the kids who struggled through middle school and could never find their niche," says Burt Haynes, band director at Gordon Lee High School in Chickamauga, Georgia. "When you can watch someone blossom and open up into the person they always wanted to be, to find that acceptance, that's something special." Freshman Audrey Bevans practices with the lower battery during the first day of the Signal Corps percussion camp at Signal Mountain Middle/High School. In the frequently hard-to-navigate world of high school, the band room is often filled with students who might not have crossed paths otherwise, united by their love of music and, often, their quest for something bigger than themselves. It can be difficult for kids to find their place in school. Give those students an instrument, the knowledge to play it and the courage to play loudly, though, and something special happens. "In high school, I think people are very pressured to fit in," says Gordon Lee color guard captain Hannah Jones. "I know I've got some quirks, and other band kids have quirks, too. This gives us a way to fit in without being pressured to change ourselves." 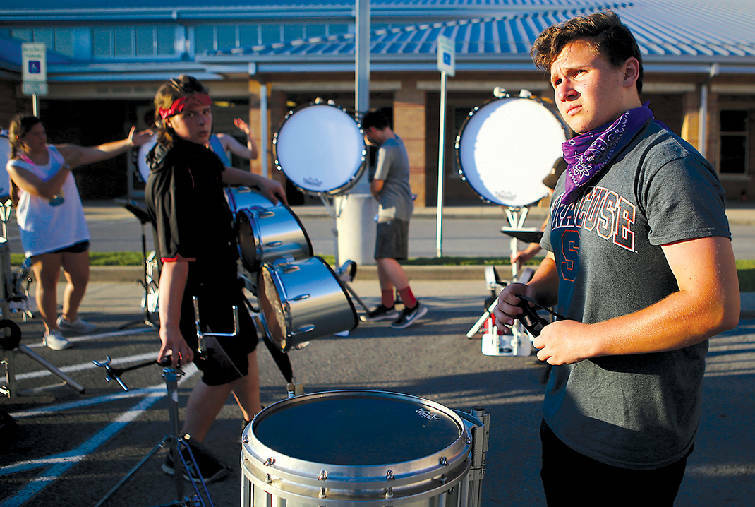 Recently, Chatter sat down with local band directors and students to find out more about this boisterous, close-knit culture — as well as the stress of competition. Mid-South Marching Band Festival in Gadsden, Alabama. The band was rated as "superior" in all categories by the judges and finished in third place. The mellophones, the marching band equivalent of the French horn, provide the middle-voice of the brass section. When Burt Haynes was a senior in the Gordon Lee High School marching band, he realized what he wanted to do for the rest of his life. He had just finished helping a freshman understand a piece of music, and that flash of insight on the freshman's face when they finally got it — that was what Haynes wanted to see every day. He's now been the band director at his alma mater for a decade, and every single day, he says he tries to make one thing clear to his students: Every day can be better than the last if they work together. "What I hope my students get out of this is to see the time and dedication they've put in and how it really pays off," Haynes says. "Band is like a family, and if they come out of my program like they've found their place and can look back on their time and be glad they participated, then we've been successful." Family is something Haynes tries to ingrain into every practice session with his students. In their makeshift practice room at Chickamauga First Baptist, the kids are crammed into a small space to start learning the music. This year, that means "Cell Block Tango" and other popular tunes from the musical "Chicago," around which their show is themed. The marching will come later; Gordon Lee is still undergoing renovations for the 2017-18 school year, and so the band will get to marching practice when the field is ready. The kids don't have to be athletes to march competitively, but there's a physicality to the practice. Just ask a tuba or trombone player how their arms feel after keeping their 10- to 40-pound instruments aloft for an entire day of band camp, which regularly stretches longer than 12 hours. It might not be easy, but Haynes knows what a group can accomplish when they work together. Gordon Lee has a tradition of attending the Peach State Marching Festival every year as a capstone to the season. Haynes' senior year, 1999, they won; the first time since the 1980s. Being a family means being in sync with one another and lifting one another up. For Haynes and his fellow seniors that winning year, that meant paying extra attention to all the new or novice members of the band and spending dozens of hours outside of practice to help them get their marching pattern and music down pat. The dedication to even the newest and least experienced members of the band built a camaraderie that grew as the season progressed. "We didn't want to leave anyone behind, and as a group, I think we all felt that," he says. That atmosphere of family is what Haynes strives for most of all in his band room, and his students know it. "We can say what we think and not be pressured because we know no one will judge us," says Hannah Jones, a rising senior and captain of the color guard, an auxiliary component of the band that dances and twirls flags, prop rifles and other equipment in time with the music. When Holly Garrett transferred to the area in the seventh grade, she didn't intend to join the band. She was asked by a teacher if she'd be interested in joining. "I didn't really say 'yes'; I kind of told him 'meh,'" laughs Garrett. "But he signed me up anyway." Now an incoming junior and the group's new drum major, or student conductor, she can't imagine her life without it. On her first day with the band, she was nervous. The only instrument she was familiar with before joining was the flute, but that problem was solved when Haynes pulled out a trombone. Garrett commented how it looked like a big slide whistle and looked fun, and thus, a trombone player was born. Later that day, though, she was still intimidated by all the older and experienced students, when a high school junior approached Garrett. "He said he was looking forward to getting to know me and having me as a member of the band family," she recalls. "Even though he was so much older, he was a person I could talk to, and that's when I realized what band was all about." "The most satisfying part of the job is seeing someone develop over time, both musically and personally," Haynes says. And like that flash of insight, that is something which he is yet to grow tired of seeing. The Signal Mountain Marching Band poses with their fifth-place trophy from the Tennessee Division II State Marching Band Championship in November 2016. It was the first time the band had made top 10 in their division in three years. Band Director Shelby Walker looks on as sophomore Gracie Bradford and the battery practice during the first day of the Signal Corps percussion camp. 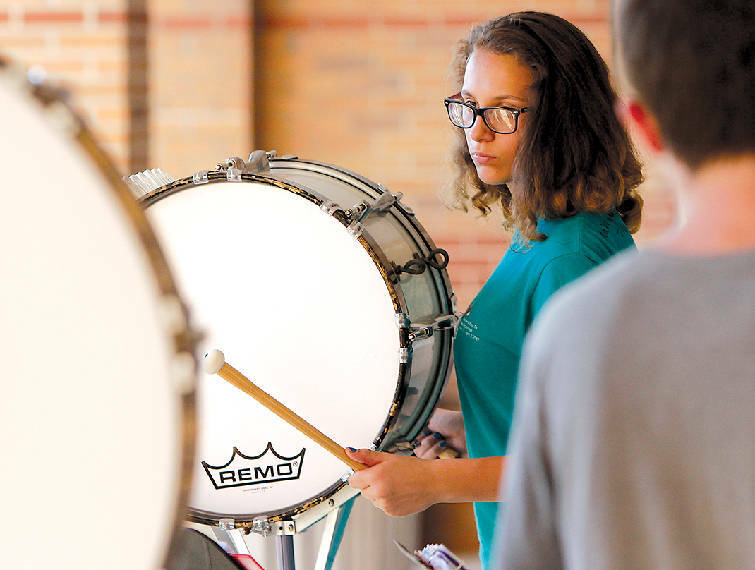 It had been two years since the Signal Mountain High School marching band had made it to the Tennessee Division II State Marching Band Championship, but during their band camp that summer, the students had set a hard goal to go all the way. They knew they had a good program and they wanted to prove it. As they waited with bated breath for the announcer to name the qualifiers for the 2016 state finals, their band director, Shelby Walker, was perhaps most nervous of all. 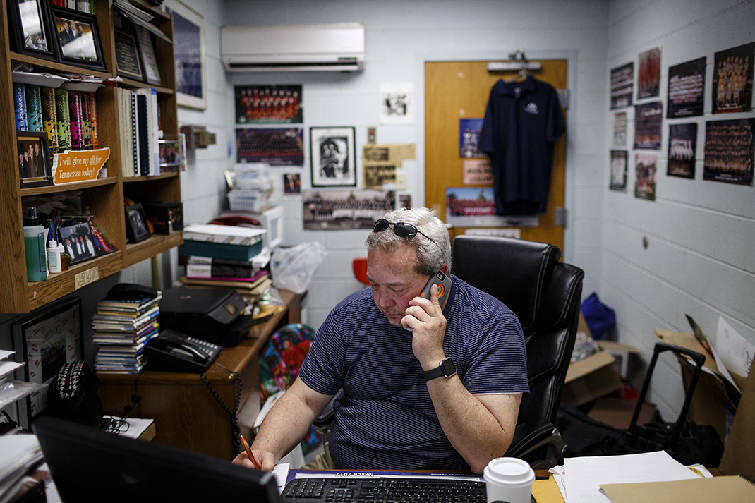 Though Walker says he tells his students all the time that trophies aren't the goal, he still shoulders the disappointment of the band's two-year losing streak. Since beginning in 2008, the group had enjoyed a reputation for success. When the judges finally announced that Signal Mountain had made the finals, Walker says tears flowed. "To see their faces when they achieved what they worked so hard to do — that was a great thing to see," says Walker. "That's what it's all about." Trombone section leader Micah Smith, now an incoming senior, says, "It was such an amazing feeling, accomplishing our goal like that. I know it's something I'll always remember. We put in so many hours of polishing and perfecting our show." Last year's winning show was an artistic rendition based on the classic baseball poem "Casey at the Bat," featuring marching patterns centered around baseball diamonds and music inspired by traditional baseball chants. 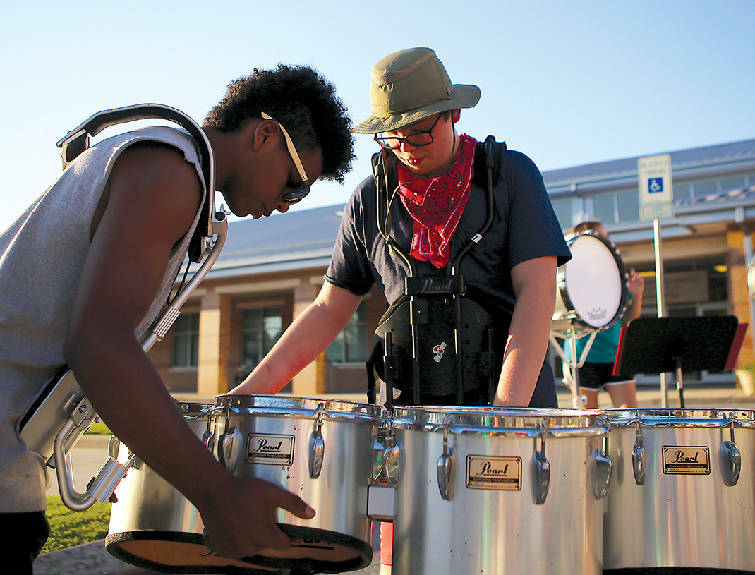 Senior Marcus Hopkins, left, checks on one of freshman Luke Anderson&#x2019;s drums. This year, they're going even more off the beaten path with a show based on the sirens of Greek mythology whose beautiful songs tempted ancient sailors to sail too close to the rocks, ultimately leading them to their doom. The color guard will act the part of the sirens from "The Odyssey," and the show will be complete with sea-centric props and flowing melodies to fit. Walker says he's more excited for this show than he has been in a long time, but in the world of marching bands, concept alone isn't enough. It takes motivation, teamwork and maintaining a positive outlook to be successful. "Mr. Walker has worked to create a culture of precision and constant improvement," Smith says. "When you're operating at such a technically high level and demanding performance close to perfection, you have to learn what work ethic and responsibility are all about." Improvement takes practice, which is why Walker is working to give his students more experience performing at various holiday parades this school year. "I tell the kids there's two kind of competitive marching bands: There's superior bands, and superior winning bands," Walker says. "The differences between the two are the little things." Award-winning shows are precise, emotional and creative, and being deliberate and vigilant in unity makes all the difference. 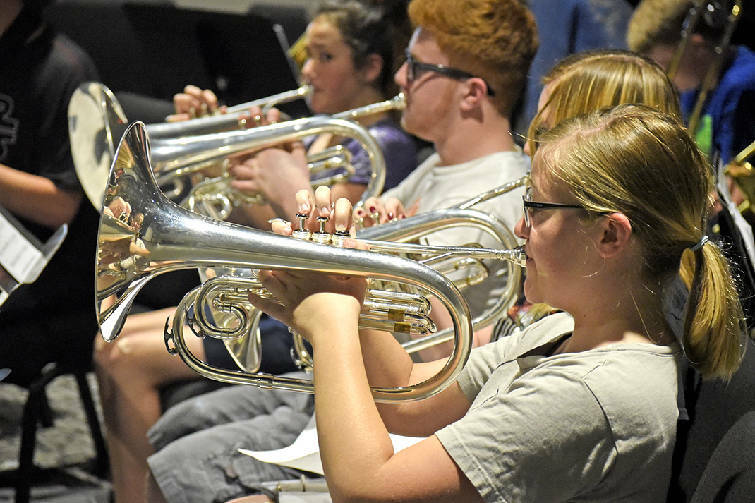 Even off the field, band students can sharpen their work ethic by keeping the band room neat, resting their hats on the ground while warming up, and sitting together during meetings both in and out of the band room, Walker says. "The kids have to buy into the process, and that's what we've been working toward," he says. "We really hit it last year, and if we can continue that, I have no doubt we can be a superior winning band." Senior R.J. Holliday, right, gets ready to practice with the full battery during the first day of the Signal Corps percussion camp. The pursuit of excellence doesn't get in the way of Walker's passion for his students, though. It is not about the trophy, he reminds them; it is about taking ownership and building community. 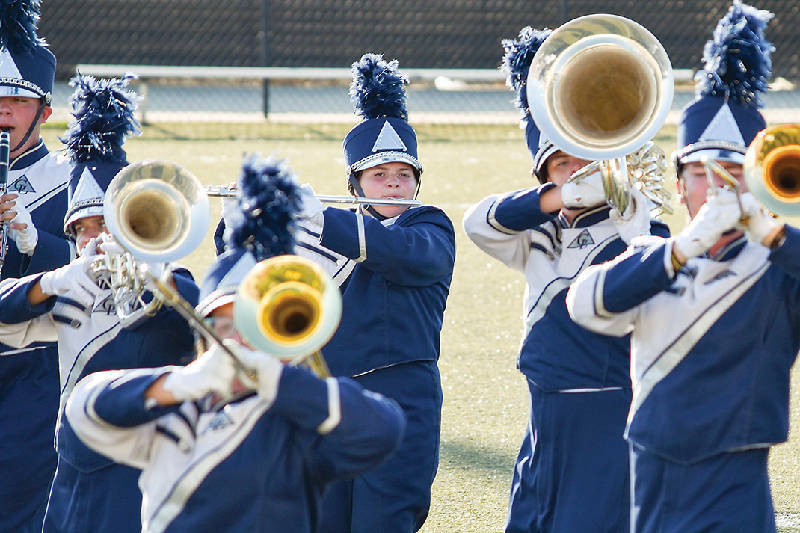 Natalie Taggart, the mellophones section leader and a rising senior, says all of the Signal band leadership is focused on the well-being of the students. "[Walker] always says it's better to try your best and make a mistake than to not play at all," she says. "He keeps us disciplined, but he always keeps it interesting. We always tailgate before the school's home football games, and Mr. Walker will come and hang out with us, throw football, that sort of thing. It feels like a family." More than anything, Walker says he wants his program to be a place where kids can feel safe and welcome. "They need to be able to be themselves and escape their problems," says Walker. After all, a comfortable, a relaxed musician will play their best, and their best is what Walker wants. "We're definitely on the path to improvement. Are we there yet? No, but we're getting close." 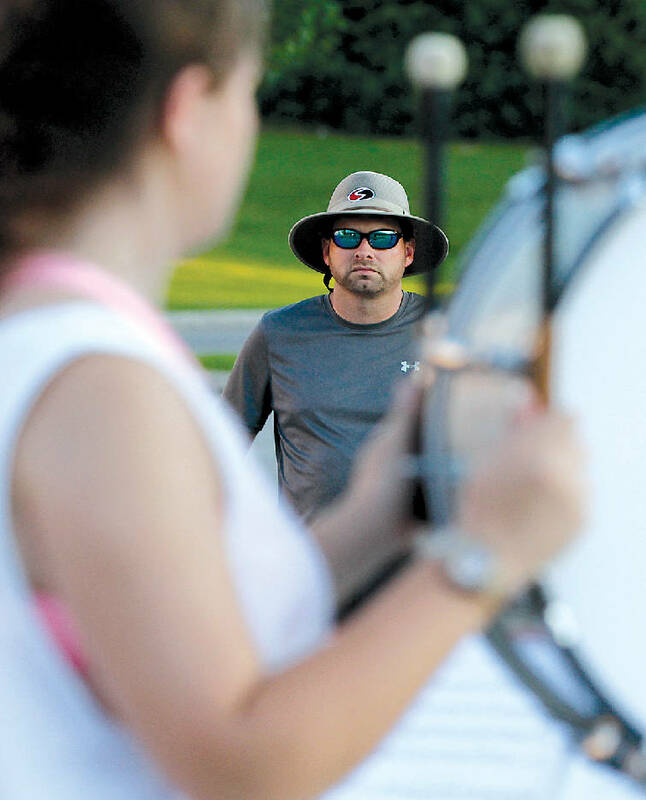 Band Director Joel Denton watches as the marching band practices at Ooltewah High School. Director Joel Denton in his office at Ooltewah High School. 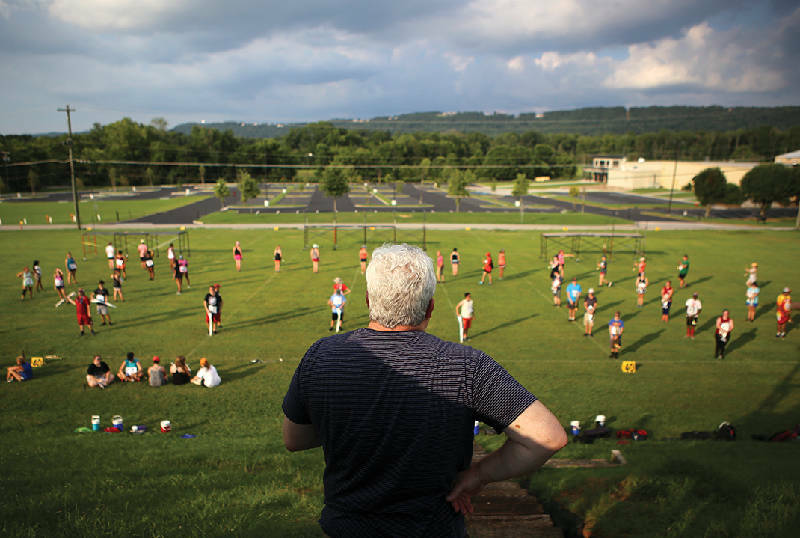 In his nearly 40 years of service to the Ooltewah High School Marching Band, director Joel Denton has learned that chasing success is not necessarily how you achieve it. "I think you'll find directors that focus hard on winning and trophies don't get much of either," he says. Success can come one year and be gone the next. Instead, Denton has raised the bar for his band family from success to significance. "Success that's what you get for yourself. Significance, though, that's what you help other people achieve," Denton explains. Still, the band's significance looks a lot like success. In 2007 and again in 2013, Denton's band class was selected by New York City parade officials to attend and perform at the Macy's Thanksgiving Day Parade along with around a dozen other high school and college marching bands from across the nation — making Ooltewah one of the few high school bands in the country to perform at the event more than once. 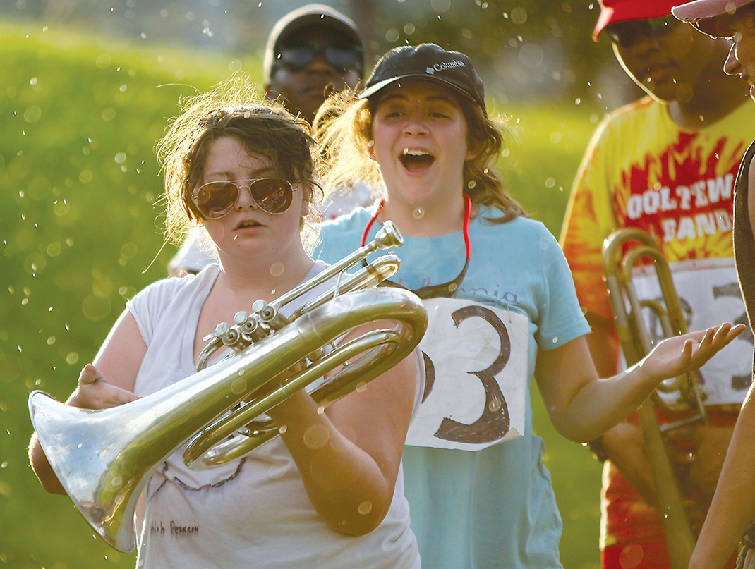 Junior Kilah Pearson, left, jokes with freshman Abby Mahoney, center, during marching band practice at Ooltewah High School on Wednesday, July 12, in Ooltewah, Tenn.
Then, in the fall of 2016, some of Denton's former band students paid for its current class to attend and march in the 2017 Tournament of Roses Parade in Pasadena, California. The annual celebration of the new year and the fresh flowers that grow in the city welcomes less than two dozen of the top-ranked high school and college marching bands from around the world. So how did Denton get his program to national significance after nearly 40 years? To hear him describe it, he has two hats he can put on as the director of the band: his cheerleading hat and his taskmaster hat. "First and foremost, I hope my kids know I genuinely care about all of them," Denton says. "I tell them I love them a lot, and it's not just words flying out of my mouth. I come to school every day not because I have to, but because I want to." Listening and advocating for his students is one of his top priorities, Denton explains. That doesn't change his high expectations for them, though. "There's a sense of dedication that you have to have to be in this band," says Alex McGlohon, an incoming senior and this year's band captain. "The bar keeps getting raised higher, and each year, the band has to step up further than they did the year before to fill those shoes." For McGlohon, success doesn't come from titles or trophies, but from recognition of all the band's hard work. "If you walk down the street and you ask someone if they've heard of the Ooltewah band and they say 'no', then we still have work to do," says McGlohon. "We want them to say 'Absolutely! Their show is amazing this year.' That's greatness to me." McGlohon and Denton are both excited for this season's show. Titled "En Garde," it will be centered around the sport of fencing, complete with prop fencing swords for the color guard and fencing gear and outfits for the band. "A lot of the choreography will relate to the back-and-forth of a fencing match," says Denton. "Tournament band is an incredibly creative art form. There's three dimensions we need to address: the sound, the visuals and the emotional appeal, or what draws the audience in. They want to see you do something different that sets you apart from other people." Nathan Smith holds drumsticks in front of a drum kit during a percussion sectional workshop at Ooltewah High School's summer band camp on Thursday, June 15, 2017, in Chattanooga, Tenn. But at the end of the day, Denton says the hardest part of his job isn't the long hours of composing a new, exciting show. Instead, it's when he sees one of his students struggling with something personal. "It's difficult to see some kids who sometimes just don't have everything they need," he says. "It could be parental support, a good home, stable finances just the struggles of growing up. I try to compensate for that through our band family, to encourage them and help them that way, but I can only go so far in helping them. It's tough." More than anything else, Denton says the band room should be a place where his students feel safe and welcome to be themselves. Ultimately, it's the students who must make their own success. It is Denton's job to model the significance. Clarinet section leader and rising senior Kaylee Meisheid says, "During the school day, before we walk out of the band room, he tells us we have to represent the school and the band. He wants to make sure we're not going to get in any trouble. He wants to show everyone the band is the best the school has to offer."